The Confirmation Dress. Honoring A Mother's Transition. Editor's Note: Daniel Cano posts this July 27th column honoring his mother, who crossed over in recent days. 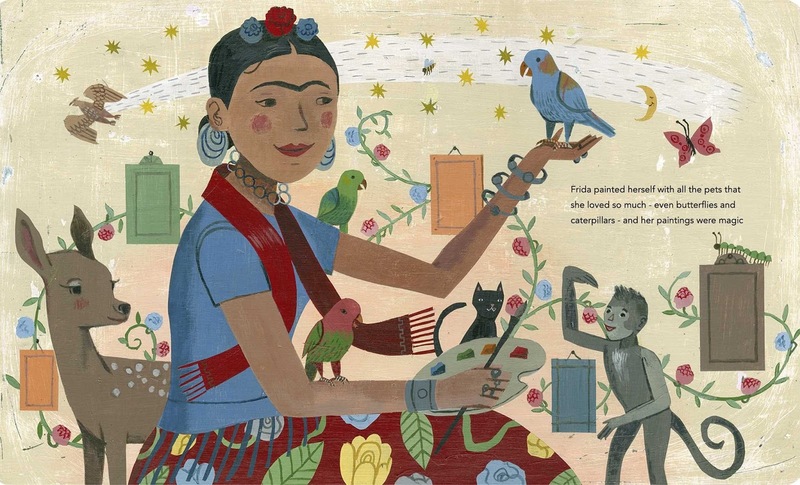 I wanted to know what my mother remembered of Mexico or at least what she had heard about it. She was born in Santa Monica, California, in 1925. She told me that she thought her mother had taken her twice to visit the family ranch in Mexico as a child. Then she went again, reluctantly, in her late teens, after spending three years in Olive View Hospital. 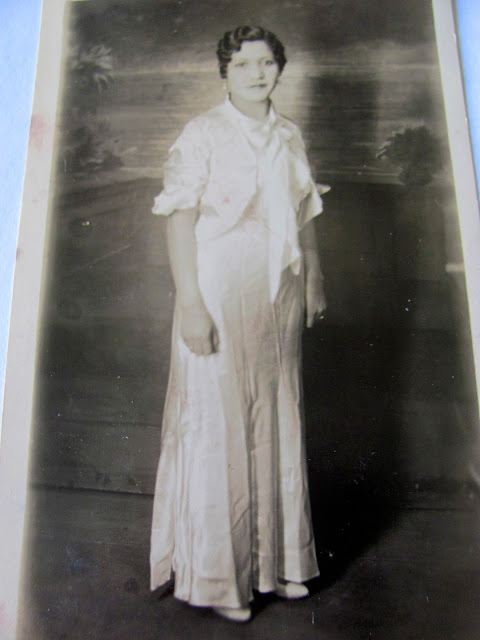 When she was about thirteen, my mother was misdiagnosed with tuberculosis. In the 1940s, doctors didn’t always take the time necessary to examine children carefully or correctly diagnose the disease that afflicted so many poor, young Mexican, and lower-class kids. Considered a highly contagious disease, many children and adults ended up in sanitariums, isolated from society. She was about eighteen or nineteen years-old at the time. Chuy was relentless. He insisted, but she had no interest in going to Mexico or in visiting family she didn’t even know. But her oldest brother persisted. She knew he had sacrificed for the family. He left school to work and help support his mother, brother, and sisters after their father’s, untimely, death. Her father, Nicolas, was in his forties when he contracted emphysema after working for years in Santa Monica’s brickyards. My uncle Chuy finally convinced her. Who knows what he promised her. As she spoke to me, and thought about it, she came to realize, as if working through a math problem: "Chuy, my brother," she said, chuckling, "had lived in Mitic for a few years. He had a girlfriend there. I didn't know then, and he didn't want my mom to know, and he was taking my mom with him. I guess he figured I could keep my mother distracted while he went to see his girlfriend. But, I think he had a baby, too. He might have even been married but nobody really knew. My brother was private." 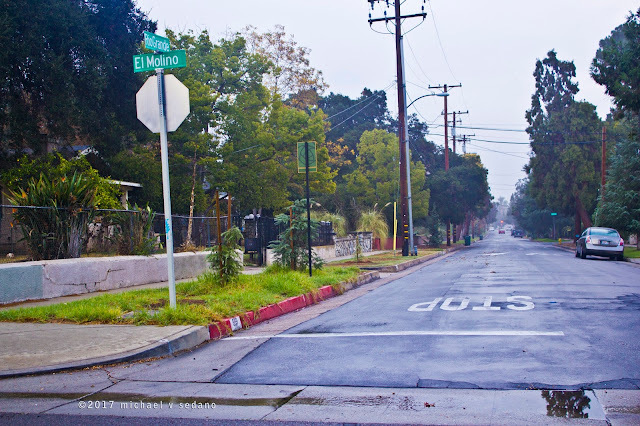 Mitic, was a once thriving village until revolutions, revolts, and draughts devastated most of it, sending the people fleeing to San Juan, Aguascalientes, and the United States, many to Santa Monica, where the people from Los Altos de Jalisco had already settled in and around Pico Boulevard and 20th Street, going back to the late 1800s. I visited Mitic in 2012 and my elder cousin Francisco, and his family still own and work the ranch. The old adobes are gone, replaced by a modern brick home, cows, and the automatic milking machines. In the distance, corn fields and trees cover the hills. Other dairy and cattle ranches dot the landscape. A small river runs adjacent to the property. It is a beautiful ranch, but still, even today, it was a jarring half-hour taxi ride over a pot-holed dirt road from San Gaspar, the closest town. I can only imagine what my mom endured in 1946. At 18, my mother was fully Americanized and not a hint of Mexican ranch life in her. She wore slacks and blouses, Rita Haworth-style, at a time when ranch women in Mexico wore long, dark dresses down to their ankles. "They were so poor," she said, referring to her relatives living in Mitic. "All they had to offer us were cooked beans and a little soup." As my mother spoke, it was as if she had transported herself back into time. She was a teenager again. 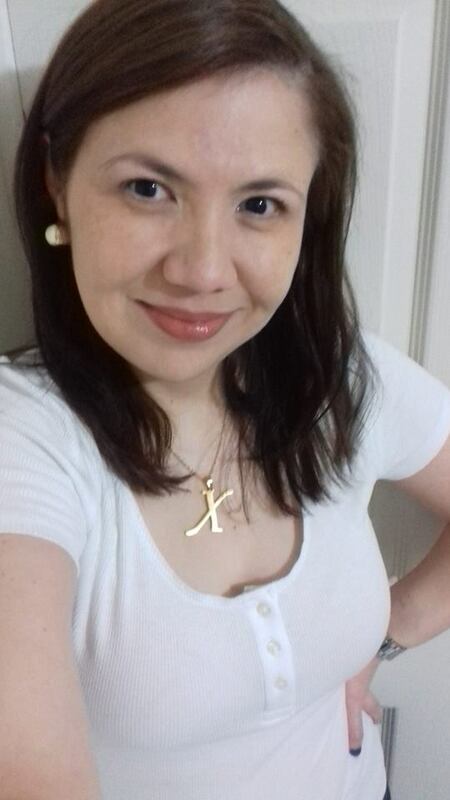 She said that while her mother stayed with relatives in San Juan, she decided to rough it and stay on the ranch with a young cousin, Patricia, whom she had met. 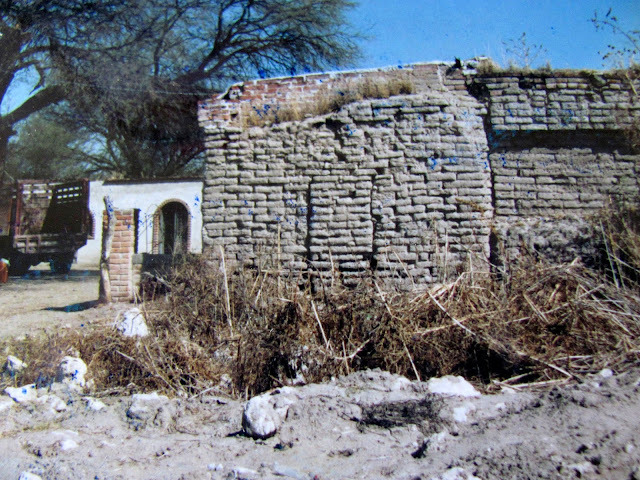 By the 1940s, the village was nearly deserted, the dirt streets empty, and many of the adobe homes decaying. Mitic had fallen onto difficult times. "I had to sleep on…not even a bed. It was like a cot, and it nearly rested on the dirt floor." She told me the house was old, made of adobe and in poor condition. At night when she tried to sleep, she could hear scampering in the house followed by banging noises. Sometime in the early morning, she opened her eyes and saw the face of a large rat staring back at her. She realized the rats were everywhere. It terrified her. The next day she told her mother she could not stay in that house another night. "I felt so bad because I had planned on staying a few nights, but the next day I packed up and left." What made her departure worse was that she and her cousin Patricia had formed a bond. My mother remembered, “She was about fifteen and very pretty…a beautiful girl." Patricia asked my mother to stay for her confirmation ceremony, which was coming up soon. My mother said Patricia had confided in her, saying she had nothing nice to wear for the confirmation. After leaving San Juan, they went to visit relatives in Aguascalientes, a major city, and back in the 40s, hours from San Juan. "Those relatives who lived in Aguascalientes were very, very wealthy." My mother described how my grandmother's sister had married a banker. The family owned a house with many rooms, the floors covered in Saltillo stone, a courtyard and fountain, and maids to care for the children. These relatives, my mother remembered, were very polite and friendly but a bit reserved, and they were wealthier and more refined than any of the relatives that had come to the U.S., including her own. As soon as my mom arrived home to Santa Monica, she excitedly told her mother she wanted to buy Patricia a confirmation dress. My mother said she picked the prettiest one she could find. She hoped the dress would fit. She and her cousin were about the same size. She wrapped it, took it to the post office, and sent it to Patricia. She wanted it to surprise her younger cousin. A few months passed. She heard nothing from Patricia or her parents. Then, after what seemed a long time, my mother received a letter from Patricia's parents. They wrote, telling my mother how much Patricia loved the dress. However, Patricia had become ill not long after my mother’s departure. After a little time, Patricia grew worse, and she died. They thanked my mother for the dress and told her their daughter looked beautiful wearing the dress in the casket. As she told me this, my mother looked at me and said, her voice cracking, "It was so sad." Posted by msedano at 2:22 PM 2 comments. Click here to leave a comment. 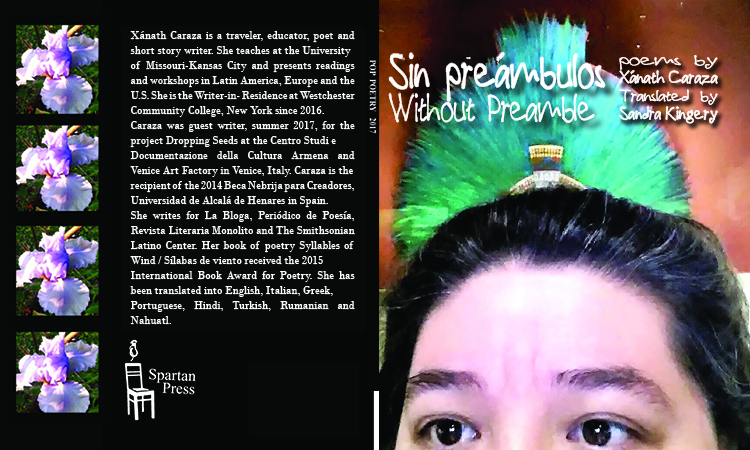 Monica Brown, Ph.D., is the award-winning author of Waiting for the Biblioburro/Esperando al Biblioburro, Marisol McDonald Doesn’t Match/no combina, and the Lola Levine chapter book series, including Lola Levine is Not Mean, Lola Levine, Drama Queen, and Lola Levine and the Ballet Scheme. 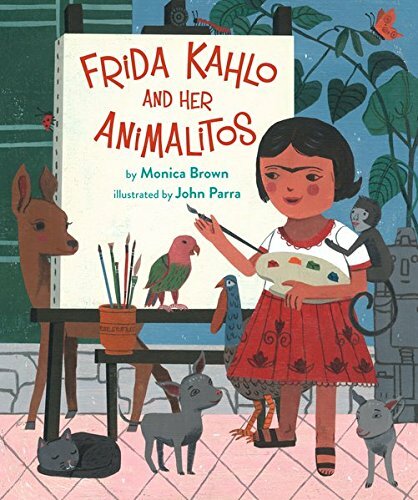 Her books have garnered starred reviews, the Américas Award, two Pura Belpré Author Honors, and the prestigious Rockefeller Fellowship on Chicano Cultural Literacy. She lives in Arizona with her family and teaches at Northern Arizona University. Find out more at www.monicabrown.net. Three Corner Views. 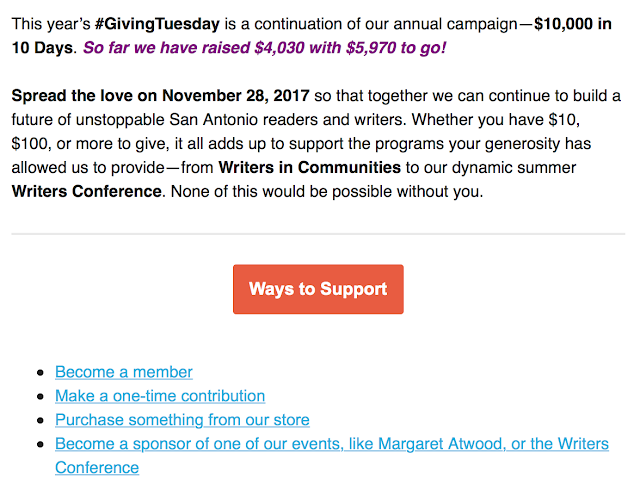 Giving Pays. It's not just that tempus fugits, it's that it goes by so fast that you turn around and some of it's completely gone. Those shoeboxes of family photographs, abandoned albums in an estate sale box, yellow sliding containers of Kodachromes snapped around the house, envelopes stuffed with negatives. Oh gosh, remember how sweet those plums grew in the back yard? This is the only foto of it, with Doggie and Licha when she was tiny. Hijole. Everyday sights disappear with surprising suddenness. Here today, gone next year and you didn't even notice. That's a great reason to carry around a camera, which is the same thing as a modern cell phone. Some photographs are made to be remembered, a way of defining people and subjects in their space and time, like Manazar concentration camp snapshots. Other photographs happen out of memorable moments, like the fistfight between a Maoist and a Marxist in front of the Silver Dollar one August 29th. These have equal value. But someone has to take them. Digital photography puts history and memory in almost every person's hands. If you do a lot of walking, make it a point to capture fixed sights over time. Never hesitate to push the button. Turn off the sound effects and always push and hold if your camera repeats. Hint: download the phone to a computer and keep your phone's storage free. A cell phone takes darn good images. Download them at full resolution for happiest results. The fotos here are made with a Canon reflex camera. November 2015, the Cedar Trees at El Molino and Rio Grande leave no doubt: drought-weakened, diseased, dead. Not only here at the corner, but eastward along half a mile of curbside. Drying relics of a more forgiving climate. A replacement cedar struggles between two stumps. 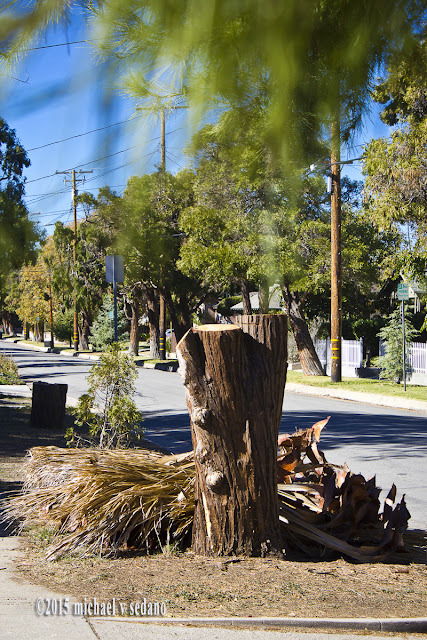 Within a few weeks, city crews arrived then split with the leña. 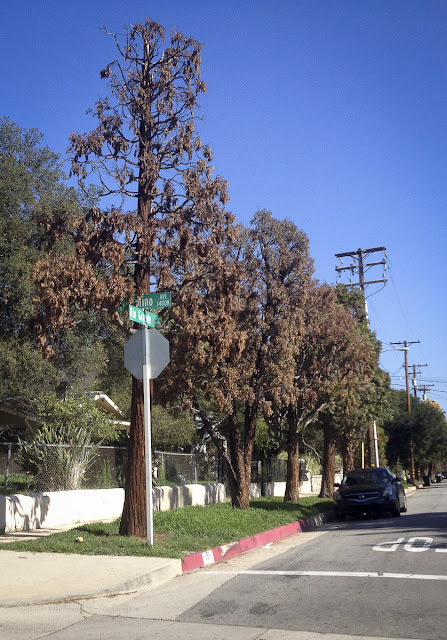 These California Incense Cedar would have made aromatic, BTU-rich firewood, on those days and nights the South Coast Air Quality Management District did not outlaw wood-burning fires. The AQMD is a little-known all-powerful unelected entity whose efforts echo a weekend warrior battling the surf with a butter knife. But it's nothing than better, that's for sure. A few months later, crews finished the removal process, grinding the roots into compost, leaving only a few scars in the struggling devil grass. November 2017, a rainy day refreshes the young Deodar cedars that survive the initial transplant. City crews pass by monthly, pouring water and nutrients on newly-planted trees.The opportunistic devil grass loves the monthly dousing. To the right, above the parked car, a healthy incense cedar looms 20 feet above the asphalt, unravaged by whatever has killed its companions up and down this street. No Matter What They Say, It Is. In these days rife with Christo-fascist hate speech, I hesitate to cite a Christian tenet that giving is a greater mitzvah than receiving. Despite the truism even Old Scratch can cite scripture for his purpose, there's truth in the tenet. When you give to a cultural group your reward far exceeds the fifty bucks. Or ten. The reward is inexplicable, and if you seek thanks or recognition, go give your shoes and warm coat to a homeless guy. But don't take a selfie when you do it, m'entiendes? This is the season you exact a cultural tithe on your spirit. Think of your fifty dollar membership as twelve frappucinos you did not buy. 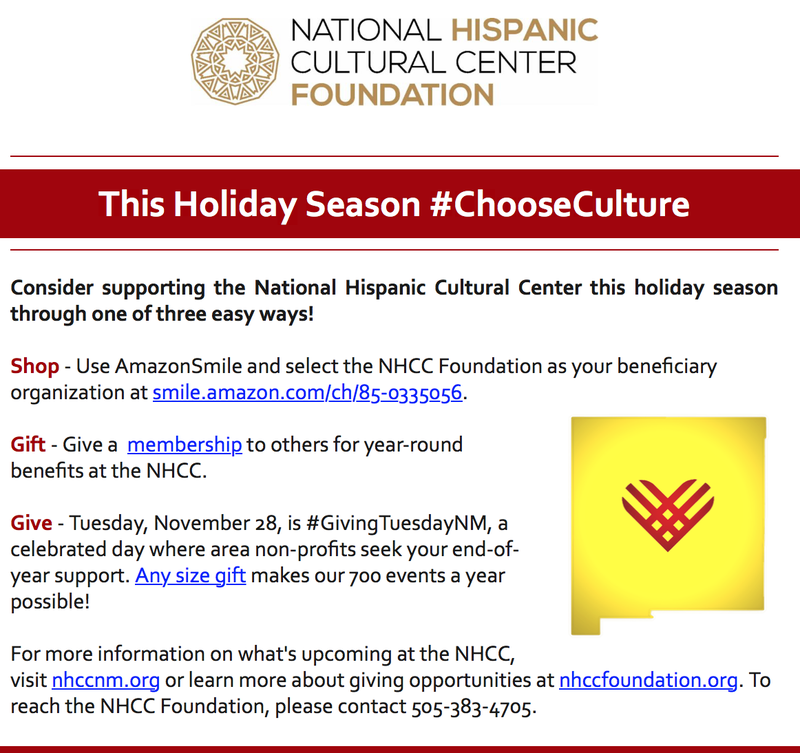 Leading La Bloga-Tuesday's list of worthy open hands is an example of what happens when communities support cultural organizations. For sixteen years, moving from location to location, Tía Chucha's has relied upon ganas and community support to grow, albeit hand-to-mouth, into an organization with the capacity to earn a substantial grant. Luis J. Rodriguez, with wife Trini, publisher of Tía Chucha Press as well as the centro, announces his aim to fund a two-year project addressing incarceration's social and individual damages. Thereafter, we roam to Alburquerque, Los Angeles, and San Antonio for messages of hope. Tia Chucha’s Centro Cultural & Bookstore, the nonprofit arts & literacy cultural space founded by Trini and Luis Rodriguez is celebrating 16 years of arts, writing, music, dance, theater, indigenous cosmology classes and pláticas, an art gallery, a bookstore, a performance space, a weekly Open Mic. 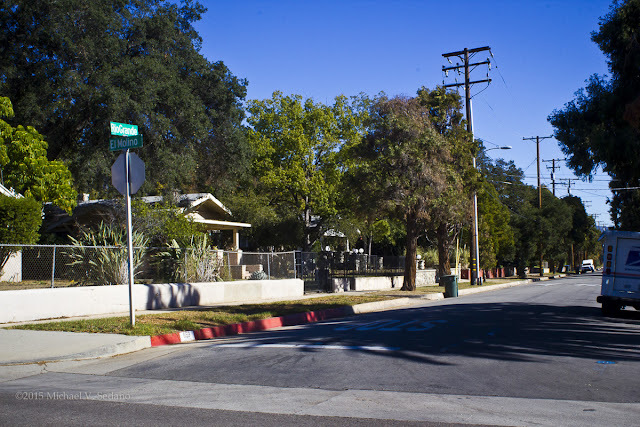 The centro serves 15,000 people a year in the Northeast San Fernando Valley. Los Rodriguez & familia have raised over a million-and-a-half dollars with donations from community but also support from friends like Bruce Springsteen, John Densmore of the Doors, Cheech Marin, Lou Adler, and others in the music and film industry. Grants and earned income from Tía Chucha bookstore and Tia Chucha Press, round out the balance sheet. 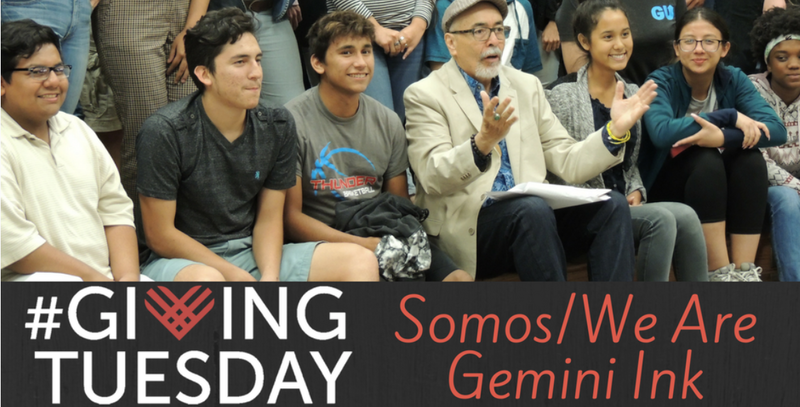 Tía Chucha Centro Cultural & Bookstore announces its biggest grant yet—$300,000 over two years from the Art for Justice Fund, supporting the project "From Trauma to Transformation." The money is geared to change the narrative and reality of mass incarceration. This begins in April of 2018. The project will entail workshops, presentations, film, books, and more. San Antoino's literacy activists offer their own three-way deal. Give. Join. Buy Something From Them. See details click here. 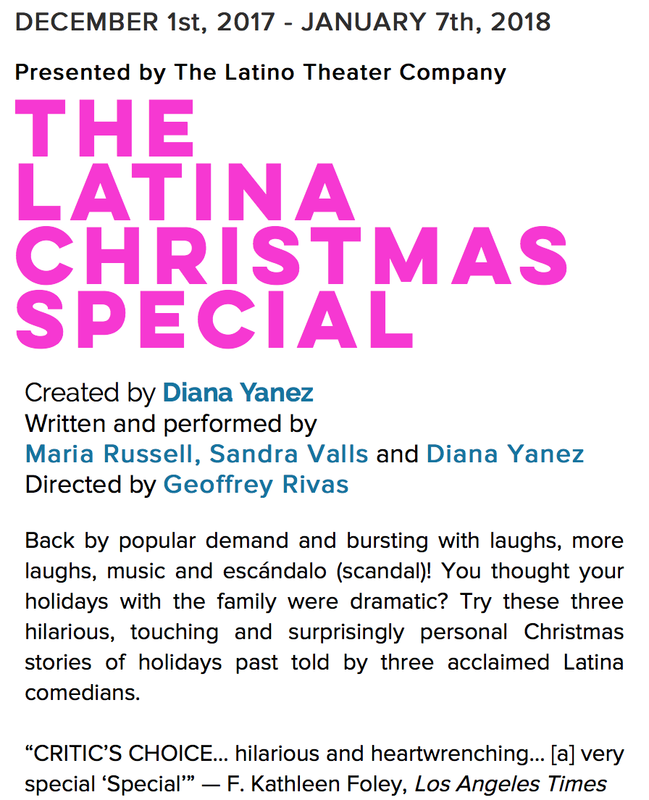 National Hispanic Cultural Center Triple Play. You Can Do All Three. Link to Membership and further information. Be a Member - No Geographic Limit On Joining. en la respiración de un animal que duerme. Sin preámbulos nos adentramos al universo poético de Xánath Caraza. 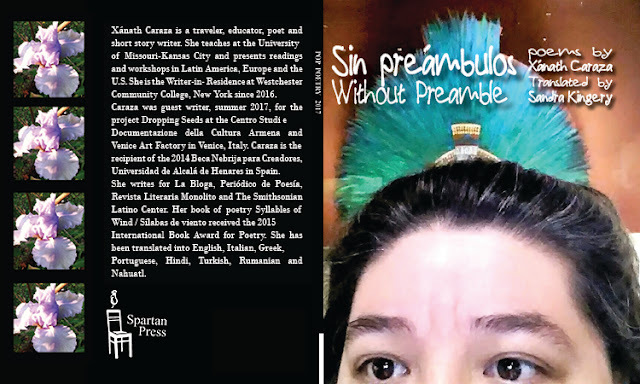 Sin preámbulos, es el más reciente libro publicado por Caraza; llega a nuestras manos gracias a Spartan Press, consta de 27 poemas, en una edición bilingüe, nuevamente, de la mano con Sandra Kingery. A pesar de su brevedad, su contenido es inmenso pues se multiplica en cada lectura. Cada verso se nos ofrece como una piedra preciosa que deja su marca, su huella en el tiempo. En un mundo en donde el paisaje global nos ofrece una visión que dista de ser esperanzada, Sin preámbulos, nos recuerda que somos tan sólo una parte pequeña del universo, y no sus dueños, como muchos parecen creer. Los elementos naturales están presentes en cada página: agua, aire, fuego y tierra nos muestran la indisolubilidad que tenemos con ellos porque formamos parte de ellos. Vivir es duro y, aun así, la vida emerge. Xánath Caraza, nos muestra al ser humano como conocedor y sensible al mundo que lo rodea. Remarca la imposibilidad de cerrar los ojos y fingir que no pasa nada, más bien, apuesta por la memoria. En un ambiente onírico, rayando en lo delirante, la poesía se torna lúgubre, las palabras brotan de la tierra, después de haber sido empapadas por lágrimas de sangre, nace la escritura. Lo vivido y lo visto se convierte en historia; pero no de las que se guardan en el baúl del rincón más alejado; no, es la vibrante, la que forma un mar de recuerdos, que se agita o se calma, como mudo testigo de lo cotidiano. Con Sin preámbulos, Caraza, nos lleva de la mano a la premisa universal del ciclo de la vida: para renacer hay que morir antes. Eso hacemos, la sociedad, tal y como la conocemos, está muriendo. Nuestro presente está grabado con la pérdida y la violencia. Vivimos con estupor, angustia y desamparo. Las noticias, de las que nos enteramos día con día, se transforman en palabras que se bordan en nuestras evocaciones con hilos hechos de nuestra propia carne, por lo que, el dolor no desaparece sino que se incrusta, dejándonos una gota de sangre, como marca de cada una de ellas. Tomar conciencia es despojarnos de las ideas inocentes creadas en nuestra infancia. Vivimos en y con el desencanto. No es el fin, sino los primeros signos de una nueva forma de replantearnos el mundo y en el mundo; para eso, necesitamos tiempo, entendido como memoria y para romper el silencio. Es entonces, cuando la poesía surge, con su canto, formando palabras que se unirán hasta moldear los versos de Sin preámbulos. Con aflicción nos recuerda que somos mucho más pequeños de lo que creemos, que la fuerza de los elementos de la naturaleza, están presentes, recolocan, limpian, nos muestran cuáles deben ser nuestras prioridades. La escritura se transforma en tierra fértil, nace, de entre las hojas y la tinta, la poesía, la que rompe el silencio, la que se tatúa en el alma y la fortalece. En este poemario, Xánath, lanza una plegaria que podría decir, más o menos, así: Voz de fuego, Voz de agua, Voz dolorosa, Poesía, saca tus uñas y aférrate a la vida, porque eres la única sanación del mundo para enfrentar al olvido. Poesía, eres lo único que no se va por entre los dedos. Xóchitl Salinas Martínez es escritora, editora, correctora de estilo, bloguera, promotora y difusora de la lectura. Estudió Ciencias y Técnicas de la Comunicación y Literatura Mexicana. Ha dado clases de literatura en universidades, impartido cursos, talleres, conferencias, círculos de lectura; así como también se ha desempeñado en distintos medios impresos, electrónicos, radiales y televisivos dentro del ámbito social, cultural y literario. Publicó su libro Espejeos por Ediciones El Viaje. Actualmente es presidenta de la A.C Los Doce. Cultura, pensamiento y reflexión, Filial Veracruz, conduce un programa de TV online, y trabaja en radio, está por publicar su segundo libro, Inventario de nostalgias y trabaja en su tercero. Posted by Xánath Caraza at 12:00 AM 2 comments. Click here to leave a comment. Review: Cages. The Gluten-free Chicano Cooks. Poetry Book Launch: "Crossing the Border"
The Rocks: A Little Piece of Shangri-La in L.A.